This time seven weeks ago, we were settling back into our house with a day old baby. Holy moly, time moves so fast. Since Baby B is changing so fast, I thought I’d chronicle a bit about him now that he is seven weeks and one day old, because, you know, it’s an important milestone. He’s really cute, that’s a given. And the more personality he gets, the cuter he gets. (Don’t tell Russ this, but every time I tell one of the older ladies at church that he looks like Russ’ baby pictures, they conclude that he’s going to be handsome – one even said “oh, that means he’s going to be movie star handsome”). He is such a good baby. 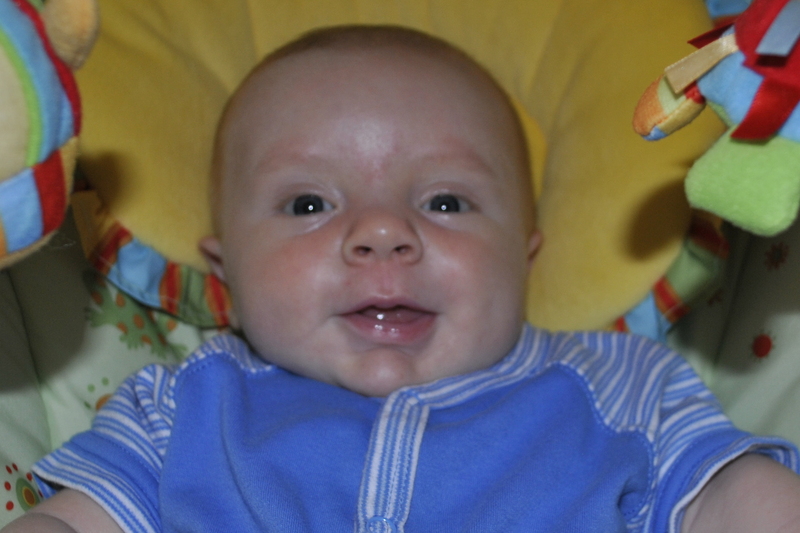 Now that we’ve gotten his reflux under control, he only really cries when he’s hungry. And if I’m on the ball, he doesn’t even get to the crying stage, he just fidgets a little until I feed him. He only gets really mad if I wait too long. He actually thinks sleep is groovy, which he sister NEVER has. He usually sleeps 7:00 pm – 7:00 am with a feeding around 2:00 am. And he sleeps most of the morning, which is very convenient for him being in my office. He sleeps, eats, and goes back to sleep until about 2:00 pm, then is awake most of the afternoon with a few catnaps. I think this was a self preservation move since it’s quiet in the mornings and his noisy sister is around in the afternoons with her singing, talking, and loud princess shoes. He doesn’t need to be put to sleep, he just drifts off on his own. He likes to be swaddled at night. He likes to hold my hand, especially when he’s eating or getting a bath. He really just likes to have something in his hand, it seems to calm him when he’s anxious. He likes the pacifier, but doesn’t use it often. It is quite handy though. Piglet never would take one, and I like being able to calm him down with a pacifier verses the acrobatics and tricks we used to have to do with Piglet. He also likes music and dancing. I have a World Music Sampler that he really chills to. He loves his sister and watches her closely when she’s nearby. She makes him smile. He was a little unsure of baths at first, but now loves them and is learning that kicking his feet to splash the water is pretty fun. 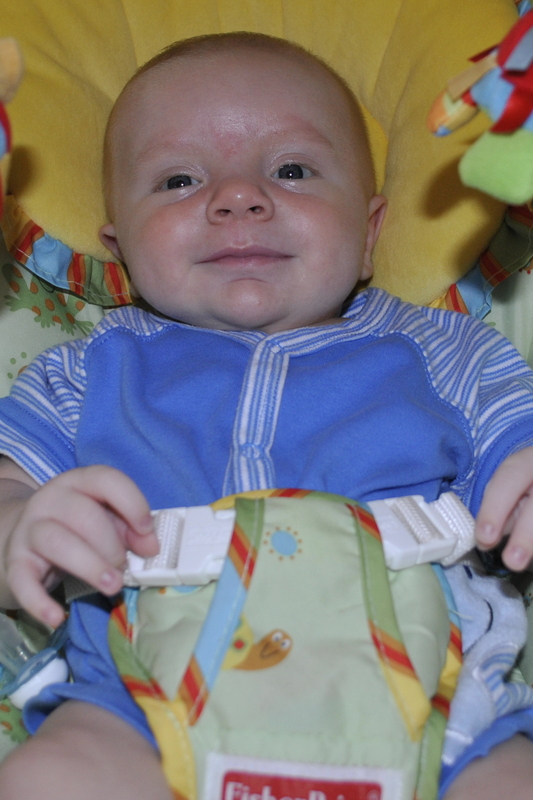 His favorite thing is the vibrating bouncy seat (where he is sitting in the pictures above). He has recently learned that he can make the toys that hang above it move, so he kicks his feet, then stops and watches them swing until they stop, then kicks again. I really like him. It’s amazing that even though he’s only been here for seven weeks and a day, it seems like he’s been a part of our family forever. He was definitely meant to be one of us. FYI – yesterday’s post now has a picture of the cutie-a-tootie that I forgot to add yesterday. I feel like he is changing so fast, I need to be there more often than once a week….wasn’t I just there Tuesday? He looks so different already! tell your husband i want med school mondays to come back so i can hear about the craziness he encounters…i’m sure it will be, well, crazy! hope you and yours are well…they seem to be!